What’s Next? Updating My Life. It’s hard for me to believe, but exactly a week from now, the Scribbler’s Retreat Writers’ Conference will be over, my speech will all but be forgotten, and I will be on an airplane, probably over Kansas somewhere, heading back here. I’m not sure what to think about that. I’ve used this conference as a beacon, something to light my way through the darkness of my grief, and soon I will have to figure out what to do when the conference is over. I’ll work on my grief book, of course, and I’ll have to figure out what to do with all my facebook groups. For some reason, they are “new and improving” them to the point of unusability, at least for my non-nefarious purposes. We had some great discussions, and the discussions will no longer be available. Don’t know what the point of that is. All of that collected wisdom just . . . gone. I also can’t procrastinate too long in upgrading the groups, or I will lose all the members. Sheesh. What a mess. But after that? Haven’t a clue. I was talking to someone today about the conference, and she asked if I’d ever taught before “other than on the internet”, and it occurred to me that in a roundabout way I have been teaching writing all along. So perhaps I’ll do writing workshops here on this blog. It wouldn’t be that much different from my various online discussion groups, but it would be more structured. Perhaps post a tutorial every Sunday night? And something similar to my presentation for the conference — creating incredible but credible characters — would be a good place to start. Besides, I need a new focus for this blog. Grief only goes so far. I’m not in the throes of grief anymore, at least not much — I keep myself too busy. I figure, if my life mate doesn’t want me to be thinking about him, he shouldn’t have died. Can you detect a hint of anger here? He used to tell me I needed to keep a pilot light of anger. He said it would fuel without consuming me. And what do you know — there it is. And it does help. Funny how life coalesces at times. Everything of my old life (both online and offline) seem to heading for another turning point. Of course, that could be an illusion (or a delusion), but it’s true that this is another time of many changes. I’ll keep you posted. And for sure I’ll get photos of the conference. Speaking of photos, you’ve all seen the rather blurry photo of me I use as an icon. 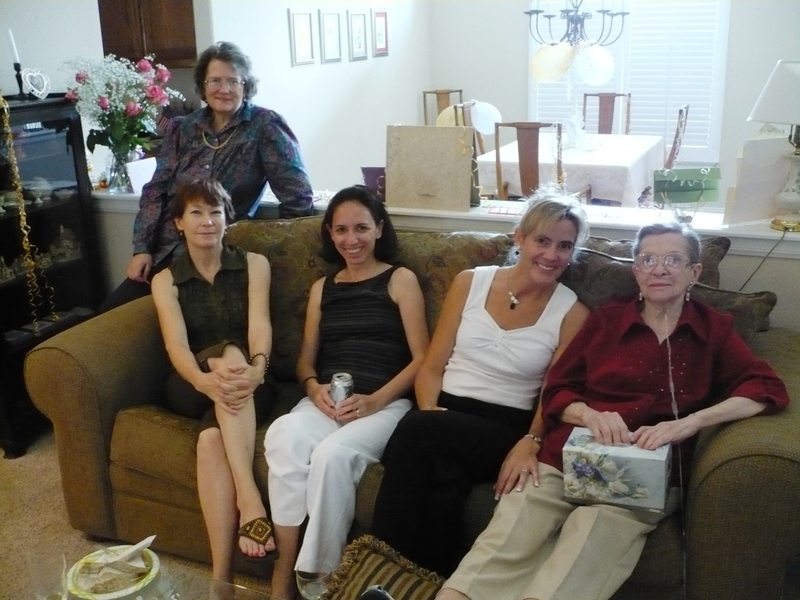 The photo accompanying this post is the picture it’s cropped from — my parent’s 60th wedding anniversary party, just a couple of months before my mother died. Happy mother’s day, Mom. Hope you’re at peace. I hope the conference goes well, Pat. I thought about showing up at the conference and then asking something wild and crazy during your presentation, but the whole shebang is a bit pricey. Have you asked Facebook support why they’re taking away group functionality? Maybe they won’t answer or maybe they’ll have a work around. A lot of people use Weber to handle their mailing lists. I used them for a while and found them an easy system to use, including keeping up with all the people who join and leave. I finally decided my website didn’t have enough trafic to generate enough people getting on the list, so I stopped doing it. Partly, it was a cost issue as well. I hope you have a good time at the conference. Malcolm, you can still come for lunch. My treat. Facebook doesn’t respond to such emails, though they did agree to update all the groups so we don’t lose our membership base. That really had everyone freaked! I’ll just do the mailing lists myself. There’s not enough traffic to make farming it out worthwhile. The truth is, most people on Facebook stopped reading group messages a long time ago, so I’ll have a very small list. I intend to enjoy myself no matter what happens! I hope the conference goes well, and I’m really looking forward to hearing your update on it! Pat, when I opened this site and saw the picture I went, wait a minute, I recognize this! Nice group shot. I hear you on the anger relflex. As for FB, they ticked me off with all these changes. Granted some are good, but man, my inbox has been indunated with emails every time a member of one of the groups I belong to comment. Sorry, that’s not an improvement. Sheesh. I’m considering e-mail lists too. Have fun on this trip. Let us know some details and post pictures. I’ve no doubt you’ll do well with this speaking engagement. You can turn off all the notifications. Go to the group page, and up in the right hand corner is “Edit settings.” Click that, then uncheck both, save, then click on “edit notification settings” and remove the checkmarks by group emails. I’m thinking it’s time to find a way around facebook. I’ve made good friends there, but I get tired of all their manipulations. I believe you have a very bright future, Pat, even brighter than you expect. God is good. He loves you. I’m glad you believe I have a bright future, Carol, because I have a hard time with it. It’s hard enough trying to keep a good attitude about today let alone some mythical future. I must be getting better with my grief, because I’ve been getting cranky and irritable with him for being gone. Hey Pat, Love picture of you and your family. Nice looking group. And I’m glad you shared the whole thing. Maybe you’ll get someone to take a picture of you in your authorly duds, including the hat, to use for your new icon. Don’t let me get dropped from whatever mailing lists you have. I love finding out about the newest books from Second Wind and playing the games is uber fun! Anger is an all-too familiar feeling in tandem with grief. From losing a close loved one or a friend or even a performer you loved. When my friend Terri died I missed her so much! I spoke at her funeral and cried. I cried at home. After some time had passed I read something I wanted to share with her and I remembered she was gone and I was so damned mad at her. I told her off sitting there in my living room. I told her how mad I was and how much I missed her. Now I talk to her every once in a while cause I think she’s around her someplace. No, not delusional, just convinced there are things we simply don’t know yet. It’s amazing any of us survive to become “women of a certain age” considering all the loss we’ve had to deal with. It does make us stronger, but darn it! They’re still gone. I’m hoping to get good photos. Sure would be nice to upgrade my icons, but so far I haven’t taken a photo I like. And that one suited my mood — looking out foggily on the world. Well, now I need a new outlook. I’ll see what I can do. I didn’t get the irony of posting that photo on Mother’s Day until just now. Only one of the women is a mother. Isn’t that odd?